The BOSS DC-2W Dimension C Waza Craft Guitar Effects Pedal resurrects a timeless classic that produces saturated modulation with studio-quality consistency in a stompbox! It isn't just limited to acoustic and electric guitar either. The DC-2W provides the same dreamy depth of sound to keyboard, vocals, and anything else you heart desires. Whether you're taking to the stage or recording in the studio, the DC-2W Dimension C is a dream come true. The classic Dimension effect is legendary thanks to its unique 3D spatial processing that sounds natural rather than imposing. The breadth and depth of movement afforded to your tone gives it an almost fluid like quality. The all-analogue circuitry performs flawlessly, just as we'd expect from BOSS' Japan-based Waza Craft team. Across the top-panel of a tank-like DC-2W you'll find four preset switches that offer sonic variations that range in depth and width. Utilising electronic switches with corresponding status LEDs, the DC-2W delivers consistent performance throughout the most demanding of gigs. Not only that, but you can activate two switches at once, which along with the two effects modes extends the available sound options to a massive 20 choices. As well as a Standard mode, BOSS have also integrated an SDD-320 mode, which faithfully captures the brilliance of Roland's legendary SDD-320 Dimension D rack effects unit. The SDD-320 was released 40 years ago and was readily adopted by audio engineers and music producers across countless hit records. Nothing was off limits from its influence from guitars and pianos to synths, strings and vocals. Even today they regularly change hands for over a grand! With the DC-2W you can recreate that sonic brilliance at a fraction of the cost. As noted above, by pressing two switches at once - an old engineers’ trick with the SDD-320 -, you can unlock further tonal flavours. To accommodate any setup and tonal preference, BOSS has equipped the DC-2W with both Mono and Stereo connectivity options. Whether you're using a single-instrument setup direct to amp, creating a signal path with greater complexity or even getting experimental in the studio, the Waza Craft DC-2W has a premium buffer and bypass circuitry to guarantee absolute tonal transparency when the pedal isn't active. The enviable consistency of a BOSS pedal is an established fact, which is why they are favoured by so many from amateur to pro. The Waza Craft team adheres to that same superior level of durability, whilst integrating meticulously crafted analogue circuitry. 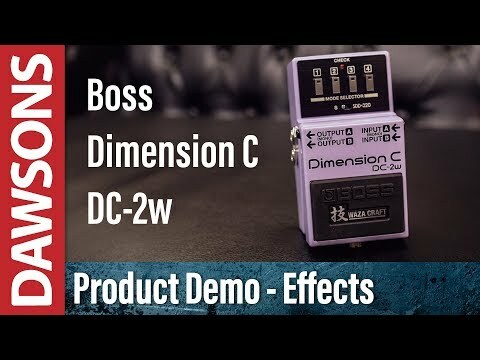 The DC-2W Dimension C Waza Craft Guitar Effects Pedal is a superb example of BOSS at their finest.